Phillip Lindsay. Credit: Isaiah J. Downing, USA Today Sports. Leading up to the Denver Broncos Week One matchup against the Seattle Seahawks, all eyes were on rookie running back Royce Freeman. Following his strong preseason, Freeman was named the team’s starting running back over veteran Devontae Booker. 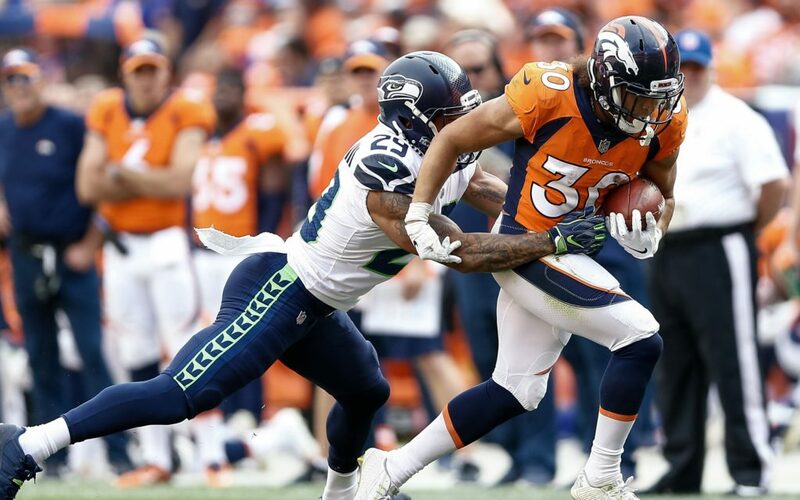 However, it wasn’t Freeman who led the way in the Broncos 27-24 victory over the Seahawks, but the other rookie running back sensation: Phillip Lindsay. Lindsay continued his inspirational NFL journey by going from Denver native, to undrafted running back, to one of the Broncos most viable offensive weapons. Functioning as the team’s primary kick returner and third-down back, Lindsay was on the field early and often for the Broncos offense. Lindsay saw extensive playing time at running back, finishing the game tied with Freeman for the most carries (15). Along with seeing the same number of carries, Lindsay also tied Freeman for the most rushing yards in the game with 71 apiece. Lindsay’s ability as a receiving back and a back that can run between the tackles made him an all-around threat for a Seahawks defense that began to wear down as the game wore on. Lindsay came out of the gate strong, scoring the Broncos first touchdown of 2018. Trailing the Seahawks by a touchdown early, Lindsay caught a pass from quarterback Case Keenum on a flat route and sprinted his way to the end zone for a 29-yard score. After his initial score, the Broncos continued to lean on Lindsay as the game progressed. Lindsay continued to run straight into the teeth of the Seahawks run defense, grinding out yards and keeping the Broncos elite pass rush well-rested. From a player who wasn’t even invited to the NFL Scouting Combine, to an undrafted rookie fighting to make the roster, Lindsay will look to continue proving his doubters wrong as he works his way towards NFL stardom. Knee-jerk reactions after week in the NFL are often never wise conclusions to jump to. However, after standout performances in OTAs, training camp and the preseason, Lindsay appears to be the real deal for the Broncos at the running back position.